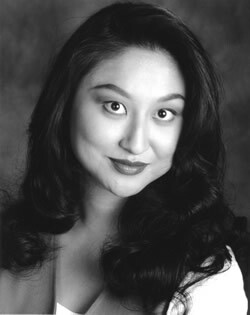 Wanda Yang-Temko, soprano - described by critics as having "simply unbelievable vocal power and control," and "a winning stage personality," soprano Wanda Yang Temko is completing a doctorate in performance from the Indiana University School of Music in Bloomington, Indiana. She holds a Master of Music degree in Voice Performance from Georgia State University and a Bachelor of Arts degree in Psychology and Liberal Studies from Emory University. She made her international operatic debut as Erste Knabe in Mozart's "Die Zauberflöte" in Rome. Other highlights include the Mother in Menotti's "Amahl and the Night Visitors" and Morgana in Handel's "Alcina". Acclaimed for performances on the operatic and concert stages, she has collaborated with some of the most renowned Early Music artists of our time, including Andrew Lawrence-King, Paul Hillier, Nigel North, Paul Elliot, and Stanley Ritchie. An acknowledged interpreter of Johann Sebastian Bach, she was a semi-finalist in the inaugural year of the Chimay Baroque Singing Competition. In 2001 she created the role of Ninfa in the Bloomington Early Music Festival's innovative production of "I lavori d'amore persi", a theatrical experience utilizing the works of Claudio Monteverdi, and was soloist in Bach's "Passion According to St. Matthew" with the Columbus Indiana Philharmonic Orchestra. As a recitalist she performs throughout the country, featuring the works of Barber, Rachmaninov, Ravel, Handel, Bach, and the great German Romantic composers. Wanda's interest in contemporary music is equally keen, as evinced by her skilled and nuanced performances of the works of Olivier Messiaen. As a professional chorister, she has performed with conductors such as Robert Shaw, Robert Spano, Donald Runnicles, William Fred Scott, and Alfred Calabrese. A multi-faceted performer, she is the host of Afternoon Classics and Concert 90 on Atlanta's own NPR affilliate, WABE, 90.1FM, where she also writes, produces, and hosts a 30 minute weekly show highlighting singers and their connections to their art and the world, called "The Art of Song." Wanda can also be heard as Detective Phillips in Mind's Ear Audio Productions' French Quarter , a radio drama series featured on National Public Radio's "NPR Playhouse." Equally at home as a stage director, she has received warm reviews for her direction of Britten's "Noye's Fludde" for the Cathedral of St. Philip.